America, ca. 1795-1810. Artist unknown. George Washington (1732-1799) profiled with hair pulled back into a ponytail and tied with ribbon, stylish in the 18th century, similar to depictions in portraits of Washington by Benjamin West, Robert Edge Pine, and James Sharples. 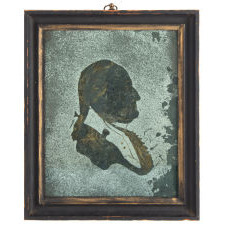 This portrait was created in a manner I have not previously seen, and can not find another with research, i.e., reverse painted and parcel-gilt on mercury silvered glass. The glass was likely first silvered, the portrait then fashioned by removing silver to create the negative space of the image, highlighted by parcel-gilt (partial gilding) then backed with pine-pitch or black paint to contrast with the silver. 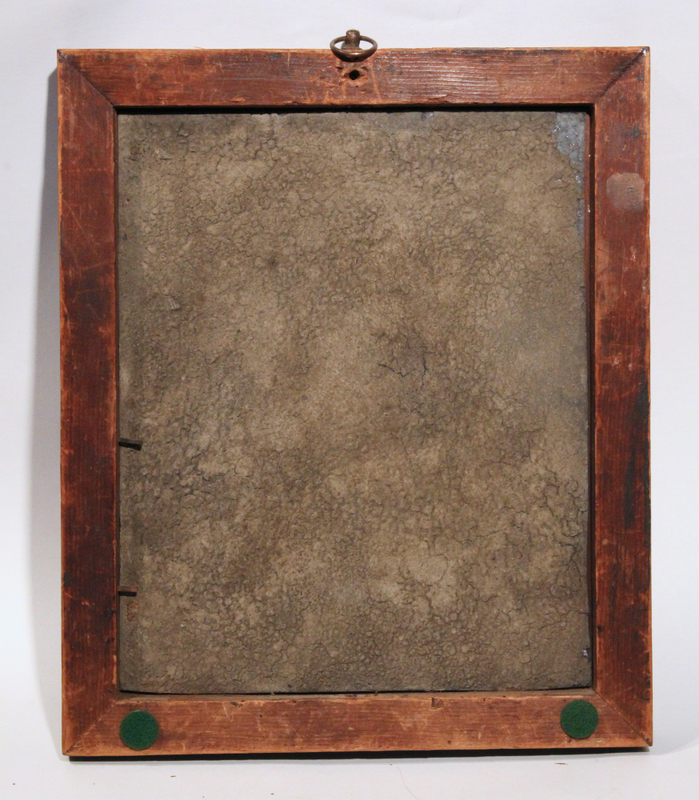 Removal of the backboard reveals that the entire back of the glass is protected with a hardened wood/paper pulp. 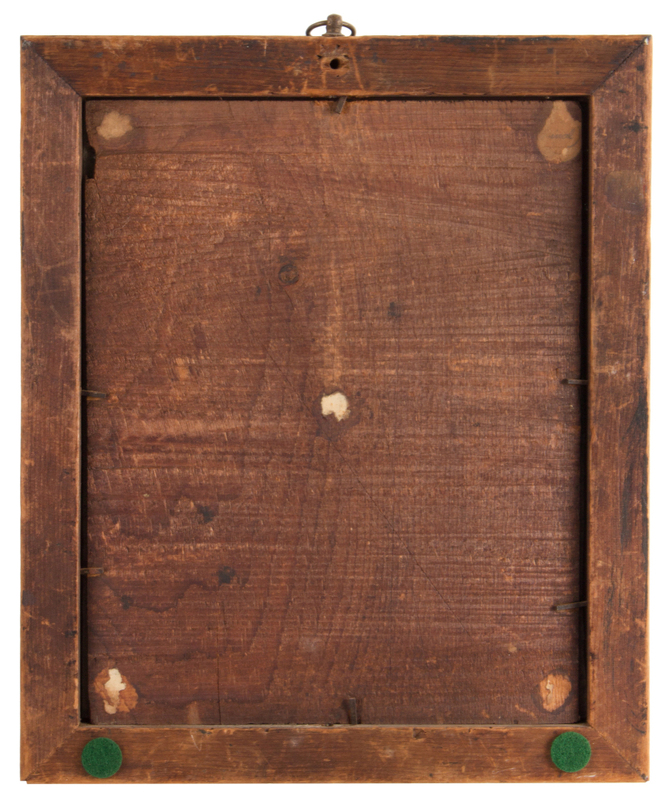 The attractive frame is original, painted black with gilt trim, and with superb patina…The sawn pine backboard is also original. 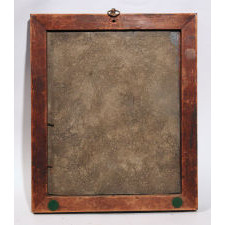 The glass is exceptionally thin, indicating 18th century making. 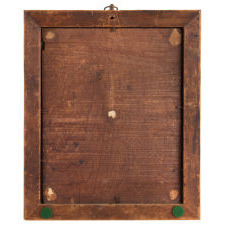 The frame is joined by un-headed sheared rectangular cut nails, typical of the transition from wrought to cut nails in the late 18th century. 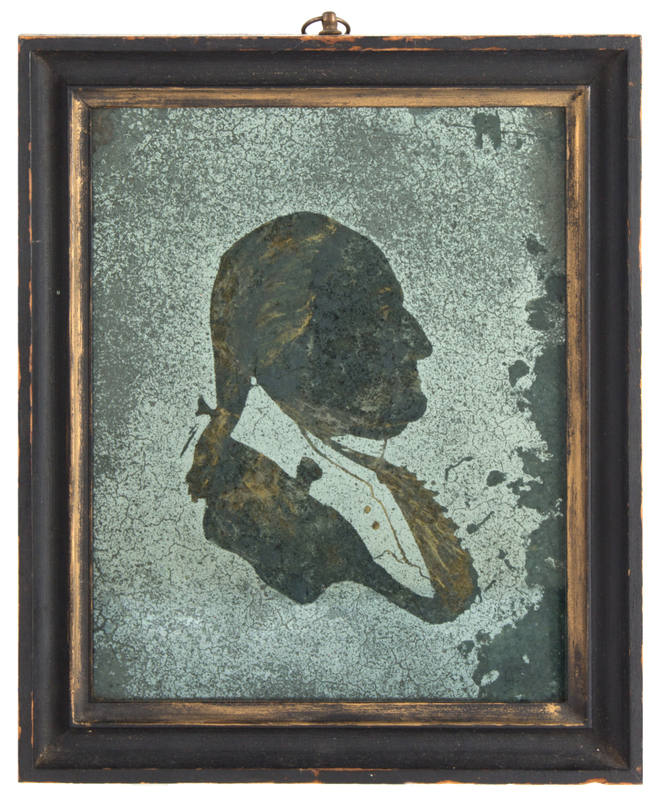 Given the period original frame, early and complex imaging process, and extremely thin glass, this portrait was likely created within a few years +/- of Washington’s death on December 14, 1799. The vestiges of time are evident, yet the instantly recognizable and iconic image of Washington is clear. Frame size about 11 ¾ x 9 ¾ inches. From a long time private collection of 17th/18th century Americana.